For anyone who loves the water, there is just something about spending time under water and exploring as it truly is a completely foreign and alien world under the sea. Of course, for most people, the further they are ever going to get underwater is how long they can hold their breathe or, possibly, a few meters further than that with the help of a scuba tank. Regardless, it really isn’t all that possible to get around under water and it can be cumbersome. This is why the C-EXPLORER 3 SUBMERSIBLE is the perfect device for anyone who wants to get into the water and explore. The C-EXPLORER 3 SUBMERSIBLE is a submarine for personal use. Now, there are all sorts of people who own boats, but how many people own a submarine? 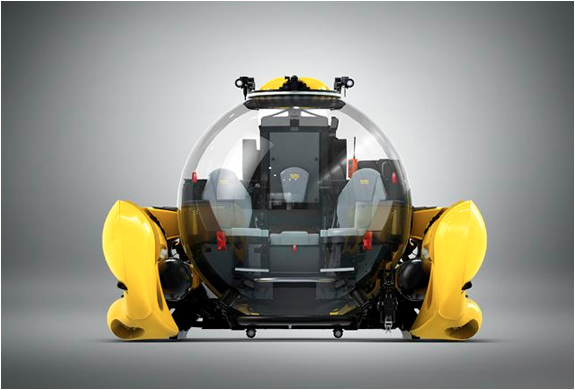 This particular model can fit up to three people, making it possible to explore the depths unlike ever before. The 3 person has a depth of up to 1,000 meters, and as it is fully acrylic pressure hull with top-hatch. There are other devices and equipment installed inside of the vessel as well, so it is one of the safest ways to explore under the water and comes with a 360 exposed dome, so passengers inside of the C-EXPLORER 3 SUBMERSIBLE can look around and just enjoy the underwater world around them. The C-EXPLORER 3 SUBMERSIBLE is a great vessel for maintenance, inspections, salvage teams and even for filming crews who are looking to expand and have the ability to film underwater footage. It really is a truly unique opportunity that is best served for those who love being under water and who want to just gout out and explore in ways they never thought possible. The C-EXPLORER 3 SUBMERSIBLE makes all of this possible.